Jamie Morgan cracked 108 for Market Deeping at Louth. Jamie Morgan struck his first ton of the Lincs Premier Division season as Market Deeping blasted their way to a 138-run win at lowly Louth yesterday (September 2). Morgan made 108 in a team total of 281-8 from 50 overs, receiving good support from James Hook (50) and Ali Sharp (33no). James Hook struck 50 for Market Deeping at Louth. Tom Anderson picked up four wickets as Louth were dismissed for 143. Bourne were losers by 138 runs thanks to an indifferent display at Boston who amassed 233-9 before skittling Bourne for just 95. Colin Cheer (5-48) was the only Bourne player to impress, although Ben Stroud bowled tidily just days after reaching 500 wickets for the club. 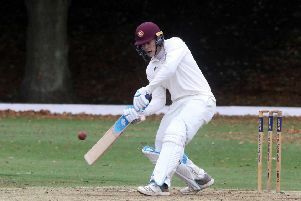 Spalding’s relegation was confirmed with two matches to spare yesterday as they lost by six wickets at Grantham for whom Lincs Minor Counties star Daniel Freeman (7-29 & 39no) excelled. Boston 233-9 (J. Cheer 53, F. Haffejee 53, C. Cheer 5-48, B. Stroud 2-46, J. Berry 2-82). Bourne 95 (J. Temple 28, R. Bentley 26, F. Haffajee 3-43). Spalding 119 (J. Butcher 37, D. Freeman 7-29). Grantham 122-4 (D. Freeman 39no, J. Miles 3-49). Market Deeping 281-8 (J. Morgan 108, J. Hook 50, A. Sharp 33no). Louth 143 (T. Anderson 4 wkts).